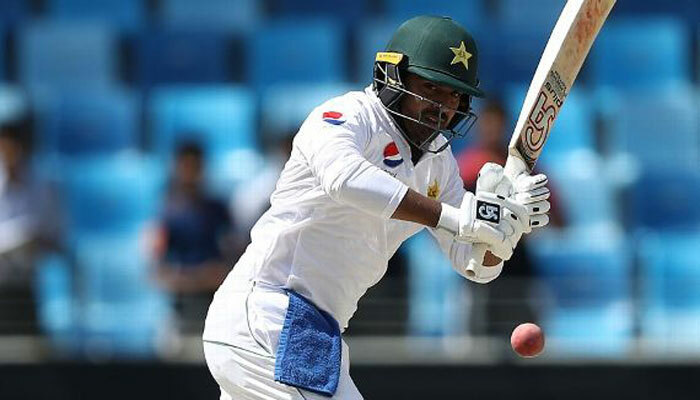 DUBAI: Australia’s openers survived a torrid 13 over spell to finish on 30 without loss after Haris Sohail’s maiden century guided Pakistan to 482 on the second day of the first Test in Dubai on Monday. Usman Khawaja was unbeaten on 17 and debutant Aaron Finch was 13 not out as Australia negotiated some tight spin bowling from Pakistan on a pitch which has started to show signs of turn. Pakistan unleashed four overs from leg-spinner Yasir Shah and a combined three from off-spinners Mohammad Hafeez and Bilal Asif, but both Australian openers looked assured. Australia trail Pakistan by 452 runs with all ten wickets intact, but they face a big battle ahead of them with Yasir Shah expected to pose the main threat. A sparkling hundred from left-hander Sohail and a polished 80 from Asad Shafiq enabled Pakistan to build on an overnight score of 255 for 3, with nightwatchman Mohammad Abbas (one) the only wicket to fall in the morning session. Sohail’s patient six-hour knock featured eight fours and two sixes, as he added 150 for the fifth wicket with Shafiq who was unlucky to miss out on his 10th century. The pair frustrated the Australian attack with some solid batting as Pakistan reached 329-4 at lunch, with both in sight of centuries. But Shafiq fell to the leg-spin of Marnus Labuschagne minutes before tea as he edged a turning ball to wicketkeeper Tim Paine for the debutant’s first wicket. 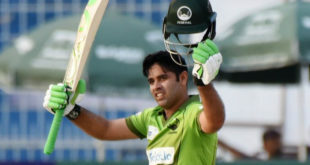 Shafiq hit nine boundaries and a six in his 278 minutes at the crease. Sohail did to get to three figures though, hitting a six off spinner Jon Holland before cutting him to third man for two to complete his century. He was finally dismissed by Nathan Lyon, caught behind as he tried to cut the off-spinner, having easily surpassed his previous best of 76 made against Sri Lanka in Abu Dhabi last year. Sohail was pleased to go on and post a big score after regularly making several promising starts before getting out earlier in the year. “I was getting out on 30-40 runs on the tour of England (in May-June this year),” said Sohail. “So I wanted to get out of that panic situation and I am happy that I have done that today. “It’s always a big pride to score a Test hundred for your country and I have worked really hard to reach this far,” said Sohail, who was sidelined for a two-year period with a knee injury in 2015. Pakistan lost their last six wickets for 72 runs, including the run outs of Babar Azam (four) and skipper Sarfraz Ahmed for 15. Fast bowler Peter Siddle was the pick of the bowlers with 3-58 while Lyon finished with 2-114 from 52 overs. Holland, Labuschagne and Mitchell Starc took a wicket each. The second and final Test will be played in Abu Dhabi from October 16.